This article is about the administrative division. For other uses, see hundred. A hundred is an administrative division that is geographically part of a larger region. It was formerly used in England, Wales, some parts of the United States, Denmark, Southern Schleswig, Sweden, Finland, Estonia, and Norway. It is still used in other places, including South Australia, and The Northern Territory. Other terms for the hundred in English and other languages include wapentake, herred (Danish and Bokmål Norwegian), herad (Nynorsk Norwegian), hérað (Icelandic), härad or hundare (Swedish), Harde (German), Satakunta or kihlakunta (Finnish), kihelkond (Estonian), and cantref (Welsh). In Ireland, a similar subdivision of counties is referred to as a barony, and a hundred is a subdivision of a particularly large townland (most townlands are not divided into hundreds). The use of "hundred" for a division of a county has what the OED describes as an "exceedingly obscure" etymology. It may once have referred to an area of 100 (or possibly 120) hides, though a "hide" is not a specific area: instead it was conceptually the amount of land required to support a family. Alternatively it may have been based on the area liable to provide 100 men under arms, or because it was an area originally settled by 100 men at arms. There was an equivalent traditional Germanic system, in Old High German a huntari, a division of a gau (and described as early as AD 98 by Tacitus – the centeni), but the OED believes that the link between the two is not established. Map of the Hundreds of Staffordshire, c. 1650. North is to the right. In England a hundred was the division of a shire for military and judicial purposes under the common law, which could have varying extent of common feudal ownership, from complete suzerainty to minor royal or ecclesiastical prerogatives and rights of ownership. Until the introduction of districts by the Local Government Act 1894, hundreds were the only widely used assessment unit intermediate in size between the parish, with its various administrative functions, and the county, with its formal, ceremonial functions. The term "hundred" is first recorded in the laws of Edmund I (939–46) as a measure of land and the area served by a hundred court. In the Midlands, they often covered an area of about 100 hides, but this did not apply in the south; this may suggest that it was an ancient West Saxon measure that was applied rigidly when Mercia became part of the newly established English kingdom in the 10th century. The Hundred Ordinance, which dates to the middle of the century, provided that the court was to meet monthly, and thieves were to be pursued by all the leading men of the district. The name of the hundred (called "wapentake" in the Danelaw) was normally that of its meeting-place. During Norman times, the hundred would pay geld based on the number of hides. To assess how much everyone had to pay, a clerk and a knight were sent by the king to each county; they sat with the shire-reeve (or sheriff), of the county and a select group of local knights. There would be two knights from each hundred. After it was determined what geld had to be paid, the bailiff and knights of the hundred were responsible for getting the money to the sheriff, and the sheriff for getting it to the Exchequer. Above the hundred was the shire, under the control of a sheriff. Hundred boundaries were independent of both parish and county boundaries, although often aligned, meaning that a hundred could be split between counties, or a parish could be split between hundreds. Exceptionally, in the counties of Kent and Sussex, there was a sub-division intermediate in size between the hundred and the shire: several hundreds were grouped together to form lathes in Kent and rapes in Sussex. At the time of the Norman conquest of England, Kent was divided into seven lathes and Sussex into four rapes. The system of hundreds was not as stable as the system of counties being established at the time, and lists frequently differ on how many hundreds a county had. In many parts of the country, the Domesday Book contained a radically different set of hundreds from that which later became established. The numbers of hundreds in each county varied widely. Leicestershire had six (up from four at Domesday), whereas Devon, nearly three times the size, had 32. Over time, the principal functions of the hundred became the administration of law and the keeping of the peace. By the 12th century, the hundred court was held twelve times a year. This was later increased to fortnightly, although an ordinance of 1234 reduced the frequency to once every three weeks. In some hundreds, courts were held at a fixed place; while in others, courts moved with each sitting to a different location. The main duty of the hundred court was the maintenance of the frankpledge system. The court was formed of twelve freeholders, or freemen. According to a 13th-century statute, freeholders did not have to attend their lord's manorial courts, thus any suits involving them would be heard in a hundred court. For especially serious crimes, the hundred was under the jurisdiction of the Crown; the chief magistrate was a sheriff, and his circuit was called the sheriff's tourn. However, many hundreds came into private hands, with the lordship of the hundred being attached to the principal manor of the area and becoming hereditary. Helen Cam estimated that even before the Conquest, over 130 hundreds were in private hands; while an inquest of 1316 found that by that date 388 of 628 named hundreds were held, not by the Crown, but by its subjects. Where a hundred was under a lord, a steward, acting as a judge and the chief official of the lord of the manor, was appointed in place of a sheriff. The importance of the hundred courts declined from the 17th century, and most of their powers were extinguished with the establishment of county courts in 1867. The remaining duty of the inhabitants of a hundred to make good damages caused by riot was ended by the Riot (Damages) Act 1886, when the cost was transferred to the county police rate. The juriscdiction of hundred courts was curtailed by the Administration of Justice Act 1977. From the 11th century in England, and to a lesser extent from the 16th century in Wales, and until the middle of the 19th century, the annual meetings of hundreds had varying degrees of power at a local level in the feudal system. Of chief importance was their more regular use for taxation, and six centuries of taxation returns for the hundreds survive to this day. By the end of the 19th century, several single-purpose subdivisions of counties, such as poor law unions, sanitary districts, and highway districts, had sprung up, which, together with the introduction of urban districts and rural districts in 1894, mostly replaced the role of the parishes, and to a lesser extent the less extensive role of hundreds. Several ancient hundred names give their name to modern local government districts. The steward of the Chiltern Hundreds is notable as a legal fiction, owing to a quirk of British Parliamentary law. A Crown Steward was appointed to maintain law and order in the area, but these duties ceased to be performed in the 16th century, and the holder ceased to gain any benefits during the 17th century. The position has since been used as a procedural device to allow resignation from the British House of Commons as a (formerly) remunerated office of the Crown. The wapentake[a] was the rough equivalent in the Danelaw of the Anglo-Saxon hundred. The word is possibly derived from a meeting place, usually at a crossroads or by a river, where one's presence or vote was taken by the brandishing of weapons. According to some authorities, weapons were not brandished during a Norse assembly (known as a þing) but were allowed to be taken up again after the assembly had finished. It is also possible that it was just citizens who were entitled to possess weapons who were allowed to take part—an idea perhaps suggested by references in the Germania of Tacitus or current practice in the Swiss canton of Appenzell Innerrhoden. The Danelaw counties of Yorkshire, Derbyshire, Leicestershire, Northamptonshire, Nottinghamshire, Rutland and Lincolnshire were divided into wapentakes, just as most of the remainder of England was divided into hundreds. In Yorkshire, a Norse wapentake usually replaced several Anglo-Saxon hundreds. This process was complete by 1086 in the North and West Ridings, but continued in the East Riding until the mid 12th century. In some counties, such as Leicestershire, the wapentakes recorded at the time of Domesday Book evolved into hundreds later on. In others, such as Lincolnshire, the term remained in use. Although no longer part of local government, there is some correspondence between the rural deanery and the former wapentake or hundred, especially in the East Midlands, the Archdeaconry of Buckingham and the Diocese of York (see, for example, Beltisloe or Loveden). William White, writing in 1882, described the wapentakes as "now of little practical value". Their potential functions had been taken over piecemeal by other units such as electoral districts, Poor-Law unions and so on. The term ward was used in a similar manner in the four northern counties of Cumberland, Durham, Northumberland and Westmorland. Irish counties were divided into baronies. Cwmwd; plural cymydau; English "commote"
In Wales an ancient Celtic system of division called cantrefi (a hundred farmsteads; singular cantref) had existed for centuries and was of particular importance in the administration of the Welsh law. The antiquity of the cantrefi is demonstrated by the fact that they often mark the boundary between dialects. Some were originally kingdoms in their own right; others may have been artificial units created later. Each cantref had its own court, which was an assembly of the uchelwyr, the main landowners of the cantref. This would be presided over by the king if he happened to be present, or if he was not present, by his representative. Apart from the judges there would be a clerk, an usher and sometimes two professional pleaders. The cantref court dealt with crimes, the determination of boundaries, and inheritance. Map of medieval Denmark, showing herreder and sysler. The entire country was divided into herreder, shown outlined in red. Coloured areas show Jutland's syssel divisions. Zealand's four ecclesiastic sysler are not included. The term hundare (hundred) was used in Svealand and present-day Finland. The name is assumed to mean an area that should organise 100 men to crew four rowed war boats, which each had 12 pairs of oars and a commander. Eventually, that division was superseded by introducing the härad or Herred, which was the term in the rest of the Nordic countries. This word was either derived from Proto-Norse *harja-raiðō (warband) or Proto-Germanic *harja-raiða (war equipment, cf. wapentake). Similar to skipreide, a part of the coast where the inhabitants were responsible for equipping and manning a war ship. Hundreds were not organized in Norrland, the northern sparsely populated part of Sweden. In Sweden, a countryside härad was typically divided in a few socken units (parish), where the ecclesiastical and worldly administrative units often coincided. This began losing its basic significance through the municipal reform of 1862. A härad was originally a subdivision of a landskap (province), but since the government reform of 1634, län ("county") took over all administrative roles of the province. A härad functioned also as electoral district for one peasant representative during the Riksdag of the Estates (Swedish parliament 1436–1866). The häradsrätt (hundred court) was the court of first instance in the countryside, abolished in 1970 and superseded by tingsrätt (modern district courts). Today, the hundreds serve no administrative role in Sweden, although some judicial district courts still bear the name (e.g. Attunda tingsrätt) and the hundreds are occasionally used in expressions, e.g. Sjuhäradsbygden (district of seven hundreds). It is not entirely clear when hundreds were organised in the western part of Finland. 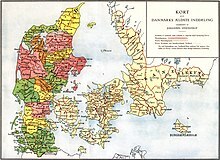 The name of the province of Satakunta, roughly meaning hundred (sata meaning "one hundred" in Finnish), hints at influences from the times before the Northern Crusades, Christianization, and incorporation into Sweden. As kihlakunta, hundreds remained the fundamental administrative division for the state authorities until 2009. Each was subordinated to a lääni (province/county) and had its own police department, district court and prosecutors. Typically, cities would comprise an urban kihlakunta by themselves, but several rural municipalities would belong to a rural kihlakunta. In a rural hundred the lensmann (chief of local state authorities) was called nimismies ("appointed man"), or archaically vallesmanni (from Swedish). In the Swedish era (up to 1809), his main responsibilities were maintenance of stagecoach stations and coaching inns, supplying traveling government personnel with food and lodging, transport of criminal prisoners, police responsibilities, arranging district court proceedings (tingsrätt), collection of taxes, and sometimes arranging hunts to cull the wolf and bear population. Following the abolition of the provinces as an administrative unit, the territory for each authority could be demarcated separately, i.e. police districts need not equal court districts in number. The term herred or herad was used in Norway between 1863 and 1992 for rural municipalities, besides the term kommune (heradskommune). Today, only four municipalities in western Norway call themselves herad, as Ulvik and Kvam. Some Norwegian districts have the word herad in their name, of historical reasons - among them Krødsherad and Heradsbygd in eastern Norway. Counties in Delaware, New Jersey and Pennsylvania were divided into hundreds in the 17th century, following the English practice familiar to the colonists. They survive in Delaware (see List of Delaware Counties and Hundreds), and were used as tax reporting and voting districts until the 1960s, but now serve no administrative role: their only official legal use is in real-estate title descriptions. The hundred was also used as a division of the county in Maryland. Carroll County, Maryland was formed in 1836 by taking the following hundreds from Baltimore County: North Hundred, Pipe Creek Hundred, Delaware Upper Hundred, Delaware Lower Hundred; and from Frederick County: Pipe Creek Hundred, Westminster Hundred, Unity Hundred, Burnt House Hundred, Piney Creek Hundred, and Taneytown Hundred. Maryland's Somerset County, which was established in 1666, was initially divided into six hundreds: Mattapony, Pocomoke, Boquetenorton, Wicomico, and Baltimore Hundreds; later subdivisions of the hundreds added five more: Pitts Creek, Acquango, Queponco, Buckingham, and Worcester Hundreds. The original borders of Talbot County (founded at some point prior to February 12, 1661) contained nine hundreds: Treadhaven Hundred, Bolenbroke Hundied, Mill Hundred, Tuckahoe Hundred, Worrell Hundred, Bay Hundred, Island Hundred, Lower Kent Island Hundred, Chester Hundred. In 1669 Chester Hundred was given to Kent County. In 1707 Queen Anne's County was created from the northern parts of Talbot County, reducing the latter to seven hundreds (Lower Kent Island Hundred becoming a part of the former). Of these, only Bay Hundred legally remains in existence, as a District 5 in Talbot County. The geographic region, which includes several unincorporated communities and part of present day Saint Michaels, continues to be known by the name Bay Hundred, with state and local governments using the name in ways ranging from water trail guides to community pools, while local newspapers regularly use the name in reporting news. Following American independence, the term "hundred" fell out of favour and was replaced by "election district". However, the names of the old hundreds continue to show up in deeds for another 50 years. Some plantations in early colonial Virginia used the term hundred in their names, such as Martin's Hundred, Flowerdew Hundred, and West and Shirley Hundred. Bermuda Hundred was the first incorporated town in the English colony of Virginia. It was founded by Sir Thomas Dale in 1613, six years after Jamestown. While debating what became the Land Ordinance of 1785, Thomas Jefferson's committee wanted to divide the public lands in the west into "hundreds of ten geographical miles square, each mile containing 6086 and 4-10ths of a foot". The legislation instead introduced the six-mile square township of the Public Land Survey System. In South Australia, land titles record in which hundred a parcel of land is located. Similar to the notion of the South Australian counties listed on the system of titles, hundreds are not generally used when referring to a district and are little known by the general population, except when transferring land title. When the land in the region of the present Darwin, in the Northern Territory, was first surveyed, the territory was administered by South Australia, and the surveyed land was divided up into hundreds. The Cumberland County (Sydney) was also allocated hundreds in the nineteenth century, although these were later repealed. A hundred is traditionally one hundred square miles or 64,000 acres (26,000 ha), although boundaries following local topography often means this is not exact. ^ Old English wǣpen(ge)tæc, from Old Norse vápnatak, from vápn 'weapon' + taka 'take', perhaps with reference to voting in an assembly by a show of weapons. ^ "Administrative Units Typology: Hundred". Vision of Britain. Retrieved 31 January 2010. ^ a b c d e "Mapping the Hundreds of England and Wales in GIS". Department of Geography, University of Cambridge. 8 June 2008. Retrieved 12 October 2011. ^ Miller, Sean (2014). "Hundreds". In Lapidge, Michael; Blair, John; Keynes, Simon; Scragg, Donald (eds.). The Wiley Blackwell Encyclopedia of Anglo-Saxon England (2nd ed.). Chichester, UK: Wiley Blackwell. p. 249. ISBN 978-0-631-22492-1. ^ "Landscapes of Governance: Assembly Sites in England, 5th-11th Centuries: Summary". UCL Institute of Archaeology. ^ a b c Bartlett, Robert (2000). J.M.Roberts (ed.). England Under the Norman and Angevin Kings 1075–1225. London, UK: OUP. pp. 165–167. ISBN 978-0-19-925101-8. ^ Coulton, G. G. (1938). Medieval Panorama. Cambridge University Press. p. 367. ^ a b c Mortimer, Ian (2011). The Time Traveler's Guide to Medieval England: A Handbook for Visitors to the Fourteenth Century. Simon & Schuster. ISBN 978-1-43911-290-8. ^ Mortimer (2011), p.308. fn.14. ^ Cam, Helen (1962). Law-Finders and Law-Makers. London: Merlin Press. pp. 59 & 67-70. Chisholm, Hugh, ed. (1911). "Hundred" . Encyclopædia Britannica (11th ed.). Cambridge University Press. ^ "Administration of Justice Act 1977, Schedule 4" (PDF). The National Archives. Retrieved 5 February 2019. ^ a b "Wapentake". Online Etymology Dictionary. Retrieved 13 July 2015. ^ The Complete Sagas of Icelanders. V. Reykjavik: Leifur Eiríksson. 1997. . The Origin and Situation of the Germans. Chapter XI. by Tacitus, translated by Alfred John Church and William Jackson Brodribb. ^ "Introduction: Lost vills and other forgotten places". Final Concords of the County of Lincoln: 1244–1272. 1920. pp. L–LXV. Retrieved 23 September 2013. .
^ Addy, John (1963). Archdeacon and Ecclesiastical Discipline in Yorks., 1598-1714. York, England: St Anthony's Press. pp. 4–5. ISBN 0-9007-0123-4. ^ White, William (1882). History, Gazetteer and Directory of Lincolnshire. p. 94. ^ Davies, John; Jenkins, Nigel; Baines, Menna; Lynch, Peredur I. (2008). The Welsh Academy Encyclopedia of Wales. Cardiff: University of Wales Press. p. 113. ISBN 978-0-7083-1953-6. ^ "259 (Svensk etymologisk ordbok)". Runeberg.org. 30 July 2009. Retrieved 31 January 2010. ^ "The Hundreds of Delaware". University of Delaware. 30 August 1999. Archived from the original on 19 May 2011. Retrieved 31 January 2010. ^ Skirven, Percy G. (1923). The First Parishes of the Province of Maryland. Baltimore: The Norman, Remington Company. p. 146. ^ a b Harrison, Samuel Alexander; Tilghman, Oswald (1915). History of Talbot County, Maryland, 1661–1861. Williams & Wilkins Company. p. 6. Retrieved 10 July 2018 – via Internet Archive. ^ Walker, Karen (28 February 2014). "Tax List: Chester Hundred, Kent County (1749)" (PDF). Maryland Genealogical Society. Retrieved 1 January 2019. ^ "District 5, Bay Hundred, Talbot County, Maryland". US Boundary.com. ^ "District 5 Bay Hundred MD Demographic Data and Boundary Map". Maryland Hometown Locator.com. Retrieved 1 January 2019. ^ "Tilghman Island and Bay Hundred Water Trails (Talbot County)". DNR Outdoor Store. ^ "Bay Hundred Community Pool". StMichaelsMD.com. ^ Griep, John. "Community group forms in Bay Hundred". The Star Democrat. ^ "Overnight rain floods Bay Hundred". The Star Democrat. ^ "Bay Hundred Elves to hold fundraiser". The Star Democrat. ^ "Band marches through Bay Hundred". The Star Democrat. ^ "Bay Hundred businesses give to Fireman's Auction". The Star Democrat. ^ Tyler, Lyon G. (January 1896). "Title of Westover". William and Mary College Quarterly Historical Magazine. 4 (3): 151–55. .
^ "A Century of Lawmaking for a New Nation: U.S. Congressional Documents and Debates, 1774-1875". Journal of Continental Congress. Library of congress. 27: 446. May 28, 1784. .
^ "Origin of the Term 'Hundred'". Place Names Committee. Darwin, AU: NT Government. 2017. Retrieved 7 April 2018. ^ "Land Survey and Disposal". Atlas of South Australia. AU: SA. 28 April 2004. Archived from the original on 15 July 2009. Retrieved 31 January 2010.